Stained glass windows are a beautiful example of the great design involved in creating a church. They allow light to shine through in multicolored splendor, enchanting the room, and providing a beautiful place to sit and worship. Seeing church windows every day keeping watch over the room makes you forget that they are historic pieces of art that sometimes need assistance to stay beautiful. Whether it’s a larger centerpiece in the sanctuary of your church or small pieces in other areas, our expert service will make the church windows look like they were installed yesterday. McCully Art Glass and Restorations is the premier expert in stained glass windows for the state of Indiana. Our services include fixing stained glass pieces that have fallen on hard times and also creating custom stained glass pieces for new homes, businesses or churches. For those looking for a way to reinvigorate a new church home, McCully Art Glass and Restorations has the perfect solution. They can create customized stained glass in a variety of formats that appeal to the aesthetic you dreamed of. We are in the business of turning dreams into reality by taking your vision and turning it into something beautiful. One of the most unfortunate situations involves building renovation or destruction that causes stained glass windows to become broken or damaged. Longstanding church windows can be harmed and the beauty they once bestowed on a room is corrupted. If this is the case, McCully Art Glass and Restorations also has the ability to perform damage control by capturing the damaged pieces and restoring stained glass pieces, re-sizing, or re-selling them. Sometimes great change occurs and a church home becomes too small for the many inhabitants within its walls. When it’s time to make the move to a larger domain don’t forget to bring along those church windows that have overlooked your services for decades. McCully Art Glass and Restorations will re-capture the windows and repurpose them for a new life in a new building. You never have to leave your historic past behind, because our expert service allows you to bring at least some of it with you. 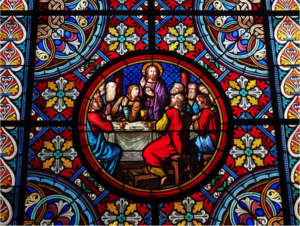 McCully Art Glass and Restorations is a name you can trust, because we have performed work on almost every historic church in the Lafayette area. We are familiar with the stained glass and always treat them with the reverence a historic relic deserves. As a member of your community, we care about the historic pieces that make this place unique and dedicate our time and business to keeping them beautiful for years to come. If you are looking to reinvigorate an old church window or find a custom designed new one, McCully Art Glass and Restorations in Indiana is the best choice.